Airway obstruction injury (suffocation, choking and strangulation) is the leading cause of unintentional injury-related death among children. These injuries occur when children are unable to breath normally because food or objects block their airways (choking), material that blocks or covers their external airway (suffocation) or items that wrap around their neck and interfere with breathing, (strangulation). Children especially those under 3 years are particularly more vulnerable to airway obstruction due to the small size of their of their upper airway, their relative inexperience of chewing and their natural tendency to put objects in their mouths. Infants may suffocate when their face become wedged against or buried in a mattress, pillow, infant cushion or soft bedding. Children can suffocate when they become trapped in refrigerators, cupboards or drawers. A majority of childhood choking injuries are due to small food items like food, nuts, grapes, carrots, popcorn, coins, small balls or balloons. Strangulation occurs among children when items drawstrings of clothing?s, ribbons, necklaces, plastic or polythene carry bags become wrapped around their neck. > Place infants on their back on a firm, flat crib mattress. Remove pillows, comforters, toys and other products from the crib. > Always supervise your child while they are eating and playing. Do not allow children under age 6 to eat foods like peanuts. Children under age 6 should not eat grapes unless the skin is removed and they are chopped into small pieces. >	Keep small items likes coins, safety pins, jewellery and balloons out of children`s reach. > Ensure that children play with age appropriate toys. 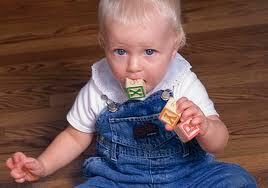 Very small toys or toys with very small parts present as choking hazards to children. > Remove hood and neck drawstrings from all children`s outer wears, necklace, purses, tajeebs or clothing with drawstrings while they are playing. > Tie up all window blind and drapery cords. Never hang anything on or above a crib with a string or ribbon longer than seven inches. > Do not let empty carry bags lie around the house, for if a child puts it over his head, oxygen is cut off and he cannot breathe. Put these bags out of reach of children. > Dissuade your children from playing in cupboards. Cupboards should not have automatic locks and indeed as a precaution, you should keep them locked. >	Always ensure that a window or door is open when burning a coke fire or using cooking gas. > Choking should be suspected any time an infant begins to have trouble breathing (coughing, gagging or making a high pitched noise while taking a breath), or is unconscious and not breathing. > If the infant can breathe, cough cry or speak, stand by but do not interfere and take the child to hospital. > If the child is not able to cry or speak, is not breathing or becomes unconscious, call for help and start back blows and chest thrusts.